I was reading through my RSS feeds this evening and came across a manifesto by Seth Godin called Stop Stealing Dreams. I downloaded it and read it in the past 2 hours. A few times while reading, I teared up. I don’t remember the exact points that I did…I just loved the thoughts that he was conveying. Bottom-line, the educational system that I was brought up in, and is currently still in use trains students to be automatons. Trained to follow directions and work in factories in the industrial age. Not thinkers, dreamers, scientists, explorers, or engineers. There are how many kids in the system now and will be soon including my son. What can we do about it? Check out this free book. It’s worth at least a 1/2 hour of your time. Depends on your point of view. 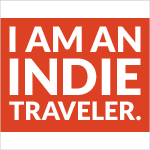 Check out Andrew’s comment on the Indie Travel Manifesto. When I arrived in Thailand 2 years ago I was on the last leg of an around the world journey with my best friend. We’d spent time all over Europe, Africa and Nepal, each place more amazing then the last. Upon arriving in Bangkok we found out the airline had ‘lost’ our luggage. It turned out to be a blessing in disguise, we spent the final month of our trip hopping from beach to beach with nothing but a few pairs of board shorts, some tank tops and a tooth brush. Simple, liberating amazing! We launched the Indie Travel Manifesto with our friend Rolf Potts today. I’m excited to be a small part in it’s creation. I feel motivated and alignment when I read it. Maybe you will too. I also wrote a guest post on Brandy’s Blog today.